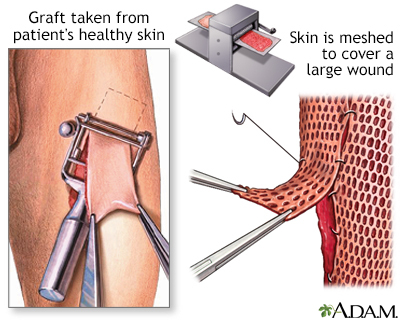 A skin graft is a surgical procedure in which a piece of skin is transplanted from one area to another. Often skin will be taken from unaffected areas on the injured person and used to cover a defect, often a burn. If the area of the skin defect is especially large, the harvested skin may be meshed to stretch it into a larger patch. If the defect involves a great loss of tissue, a full thickness graft, a flap of skin with underlying muscle and blood vessels, may be required. Taking the graft from the injured person makes rejection of the tissue unlikely.